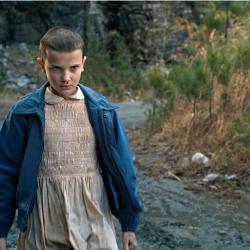 Join us for our Stranger Things Season 2 Marathon! We are showing season one in its entirety. Come watch all or some of the episodes. We will be selling pizza and drinks for dinner! Stranger Things season 2 begins nearly a year after the first installment, on Halloween in Hawkins, Indiana. (The boys are going as the Ghostbusters, naturally.) Will has rejoined his pals after being rescued from Things’ alternate dimension, the Upside Down. But all is not well with young Mr. Byers, as evidenced by the slug he coughed up in season 1’s final moments. This is free event and is open to all but is geared for tweens, teens and adults. Common Sense Media recommends it for ages 14+ It’s creepy and can be scary. Check it out before bringing young ones.